Every year American’s spend over $2 billion on Easter candy! About 70 percent of all Easter candy sold is chocolate. Let’s take a look at some Easter candy favorites and swap all that sugar and calories for some items on any runner’s wish list. Peeps are an essential Easter basket treat and a Run Jen Run favorite. You may be thinking - wow, no fat! And each Peep is only 28 calories? - but have you noticed how much sugar makes up this marshmallow goodness? And the carbohydrate count is 36g (0g fiber), which is about 12% your recommended daily value. If you’re like me and can’t pass them up, buy the single serving pack to avoid overindulging. When I was younger and didn’t understand nutrition facts or serving sizes, I never ate just one Reece’s Peanut Butter Egg. That is scary! Each individually wrapped egg is 190 calories and contains a lot of fat, sodium, carbs, and sugars. They are highly processed and you would need to run about 2 miles to burn off each one of these delicious eggs. You must decide, is it worth it? Another Run Jen Run favorite. What stands out to me on the nutrition label is the 8 grams of saturated fat. Saturated fats are fatty acids with a single bond between the carbon atoms. They increase LDL cholesterol (the bad kind) and consuming too much can increase the risk of heart disease and stroke. The American Heart Association recommends limiting the amount of saturated fat to less than 7% of daily calorie totals (or approximately 140 calories in a 2,000 calorie/day diet). Not a Run Jen Run favorite but a very popular Easter candy. High calorie count. High fat content. Lots of carbs. Only 1g fiber. Lots of sugar. This one is for Linda Lou. The plus is there is no fat. The negative is the carb and sugar content. Like all candy, eat in moderation! I you’re not familiar with them, Picky Bars were created by pro runner Lauren Fleshman (she has a fan club and yup, I'm a member), her pro triathlete husband Jesse Thomas, and pro marathoner Stephanie Rothstein Bruce. I met Stephanie in Falmouth 2 years ago and her husband Ben Bruce has run Falmouth a bunch of times – a really cool couple. Anyway, Picky Bars are gluten free, dairy free, have no artificial sweeteners, and contain a 4:1 carbohydrate to protein ratio. Why Run Jen Run loves them - They’re organic. Honey Stinger treats come in some really yummy flavors. I prefer gummy to gel. 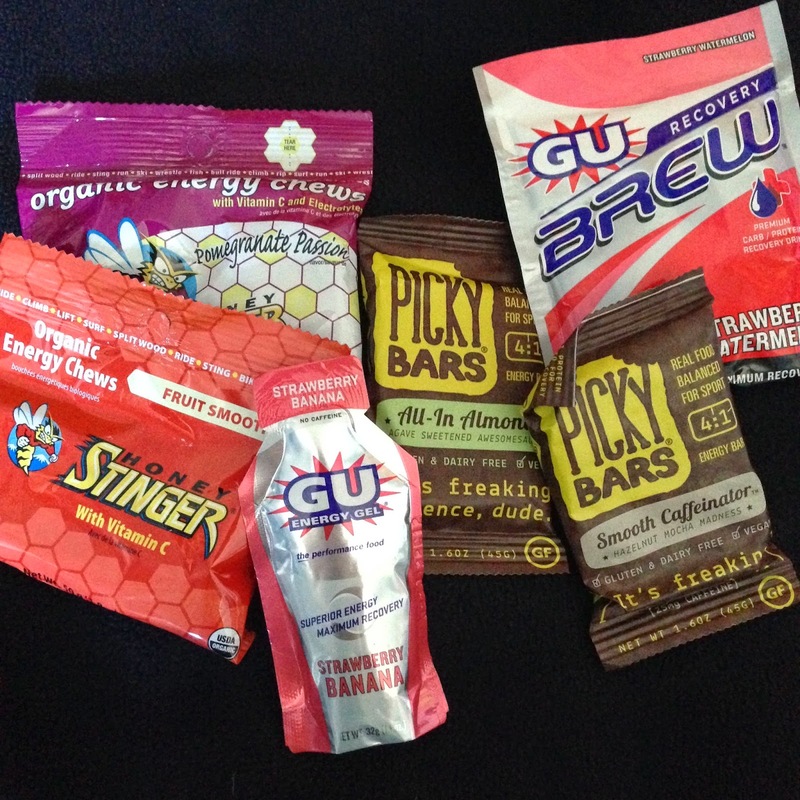 They are great for long runs (or rides) and a perfect snack before spin class! One of the best gifts you can give yourself or your family members. All runners need to own a Road ID bracelet. From their website, “In the event of an accident, if you can't speak for yourself, your Road ID will. It's not just a piece of gear - it's peace of mind.” We live in a crazy world. It’s better to be prepared. Safety first! I had to - It's a must have for any Buffalo Bills fan. Proceeds go to the Roswell Park Cancer Institute. Just released are “Kelly Strong” bracelets to show your support and prayers for Jim Kelly, a legend of Western New York and NFL Hall of Famer.